Kiwifruit are sprayed in late winter with hydrogen cyanamide to enhance with bud burst. The trellis layout of kiwifruit vines in combination with the canopy dormancy at that time of year means that a higher portion of the spray is able to drift away from the canopy. 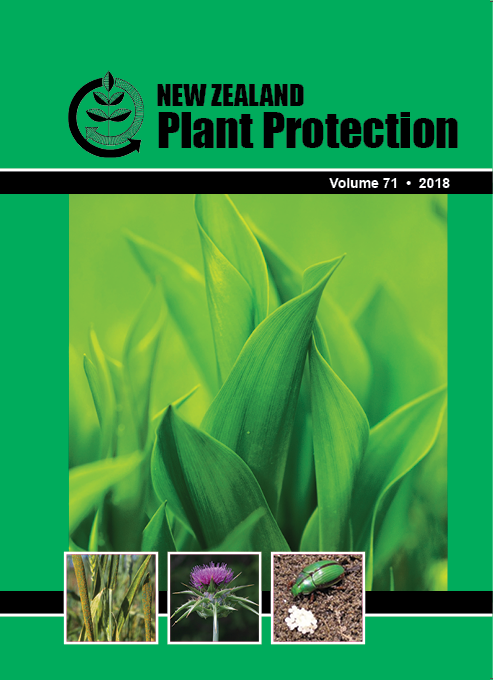 A spray application field study was conducted in a kiwifruit orchard to investigate spray drift potential, with particular focus for conditions relevant to hydrogen cyanamide applications. Spray application with conventional airblast-sprayer hollow-cone nozzles/adjuvant was compared with air-induction (AI) nozzles/drift-reducing adjuvant. Spray was applied every second row in the orchard with spray drift sampling conducted by measuring vertical distribution of spray deposition on both sides of the downwind shelterbelt. The trial showed that airborne drift carried to a height of at least 15 m to the downwind edge of the orchard, which was the height of the vertical sampling towers. The air-induction nozzle/drift-reducing adjuvant system reduced the drift intercepted at 15 m height on the downwind side of the shelterbelt by approximately 78% compared to the standard nozzle/adjuvant system.